Minimum 10ft from any source of ignition i.e. generator, air conditioner, pool heater, outdoor electrical outlets, transfer switches etc. What are the dimensions of the tanks? What colours are available for the tanks? Horizontal tanks come in Forest Green, Vertical tanks come in White. Can lattice be placed around the tanks? We don’t recommend putting any combustible material around the propane tank. What is the life expectancy of the tanks? Tanks can last upwards of 25 years, however Budget Propane is required to complete regular maintenance of the tanks such as paint, relief valve inspections, and relief valve replacements. What is required for the 10 year inspection on the tanks? The 10 year inspection does not only included the propane tank(s) on site but the primary purpose is to ensure that all propane burning appliances have been installed according to code and meet all clearances required. Where is the gauge located on the tank/tanks? Underneath the lid of the propane tank. Can the tank/tanks be painted a different colour? It is Budget’s policy to allow our customers to paint the tank providing that the paint used is a rust proof paint, that the paint is glossy (to reflect heat) and to ensure no dark colour such as Black, Navy Blue or Dark Brown are used as they would attract heat. 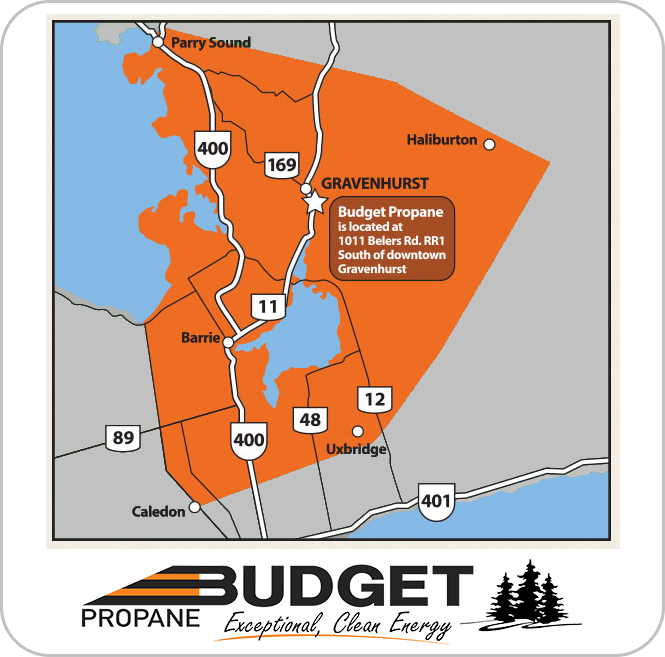 We do kindly ask if our customers can maintain a path to the propane tank in the winter time and keep the tank clear of any debris, wood piles or snow throughout the year.